Break the fourth wall when you dress as Deadpool with Rubies' Deadpool Speech Bubble Deluxe Mask which comes with a speech bubble headband. 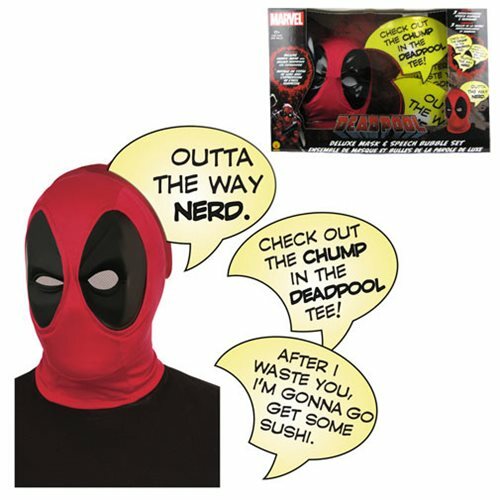 This full-size roleplay mask comes with interchangeable PG-rated Deadpool quotes on clear vinyl that affix to the mask's speech bubble headband. Quotes include "Outta the way, nerd," "Check out the chump in the Deadpool tee," and "After I waste you, I'm gonna go get some sushi." Plus, this mask set comes with an exclusive edition of Marvel Comics' Deadpool & The Merc$ for Money #1! One size fits most. Ages 17 and up.